Sierra Leone has a new President. But there is something extraordinary about Julius Maada Bio, who is no stranger to his country’s politics. This is a fascinating account and background on the former junta leader whom our correspondent, Lansana Gberie, interviewed back in 2012. When a former military leader organises an election and hands over power to the winning civilian, that is a cause for celebration. That is what Julius Maada Bio did when handed over power to Ahmad Tejan Kabbah in 1996, and then went off to the USA to study at the American University. He returned home and aspired to become the opposition Sierra Leone People’s Party’s (SLPP) presidential candidate for 2012. Alone of all the core members of the National Provisional Ruling Council (NPRC), the fresh-faced junta that ruled Sierra Leone from 1992 to 1996, Bio has somewhat thrived, and has remained a national figure. His senior colleague, Valentine Strasser, who headed the NPRC for a time and was pushed aside by Bio, is a shambling, barely recognisable figure who occasionally rants incoherently from his home outside Freetown. When he handed over power to President Ahmad Tejan Kabbah after elections in 1996, Bio went to study in the USA, including at the American University in Washington, where he earned a masters degree in International Relations. He then returned to his country and started a pharmaceutical business. When that went nowhere, Bio started another business, exporting cocoa and coffee. He also re-entered politics, joining and contesting (without success) the Sierra Leone Peoples Party (SLPP) leadership position. At 46, Bio campaigned once again to become presidential flag-bearer of the SLPP (the key opposition in Sierra Leone); if he is successful in March, he will then face the current president, Ernest Bai Koroma, at the polls in 2012. And he will have a credible prospect of becoming, once again, President of Sierra Leone. Although this may be unfair, it might be said that Bio’s continuing gravitas – compared to his ex-junta colleagues – is due to his descent from a ruling house. The Bio family home was too crowded: 35 children and nine wives (not to mention the many dependants. It was more like a village than a home. He has a distinctly regal demeanour and perhaps a sense of entitlement. But Bio thinks otherwise. “I am one of 35 children of Paramount Chief Charlie Vonie Bio. In fact, I was the 33rd child. That’s not the greatest start in life,” he said, sardonically, when I met him at Mamba Point Hotel in Freetown. For his studies, Bio had to move elsewhere. He went to stay with his elder sister Agnes, who was a schoolteacher in Pujehun, many miles away. Bio stayed with Agnes for five years, and remembers those years with great fondness. From the way he speaks about it, Agnes was more of a mother than an elder sister to him. Her influence over him was overwhelming. Agnes sent Bio off to the Bo School, a famous boarding school some miles away from Pujehun, where he spent seven years, and became Prefect for Discipline. He left in 1984 with ‘A’ levels and became a teacher at a Methodist secondary school. He taught there for a year. Aged 21, Bio applied in 1985 to enter Fourah Bay College which, founded in 1827, is the oldest Western-style university in West Africa, and perhaps the region’s most famous. Shortly after he did so, however, someone mentioned to him that the army was recruiting new cadets. “I was instantly thrilled. I had always wanted to do public service: it was the way I was brought up. And the army offered the most direct and unambiguous opportunity for that, so I applied immediately,” Bio recounted. This explanation appears correct – but only just correct: the Sierra Leone army did not have a high reputation for public service in 1985. It had been politicised and degraded by the then President, Siaka Stevens, and his All People’s Congress (APC) one-party state. The army was headed by a pliable Falstaffian character named Joseph Momoh, who Stevens had made a member of parliament, and would soon become his successor as president. By the time Bio applied to become a cadet, it was already clear that Momoh would replace Stevens as president. This would have provided an attraction of sorts for an ambitious young man, in more ways than one. Bio’s colleague and exact contemporary, Valentine Strasser, told Ann Bushby of the London Observer newspaper shortly after he became leader of the NPRC that he had joined the army, at about the same time as Bio, primarily to carry out a coup against the “rotten” APC regime. the Sierra Leone army did not have a high reputation for public service in 1985. It had been politicised and degraded by the then President, Siaka Stevens, and his All People’s Congress (APC) one-party state. The army was headed by a pliable Falstaffian character named Joseph Momoh, who Stevens had made a member of parliament, and would soon become his successor as president. Bio trained at Benguema, and graduated in October 1987 as a Second Lieutenant. He was posted at the Lungi Airport, and then later in the Kambia District as part of the Economic Emergency Unit created by the already faltering Momoh regime to combat the deepening meltdown and criminality of the state. The following year, 1988, Bio was reposted at Lungi to be trained by the UN in aviation security. After the training, somewhat curiously, he was sent to Benguema as a platoon commander. In 1990, he was brought back to Lungi. War had broken out in Liberia, triggering a massive humanitarian crisis. Tens of thousands of Liberians were fleeing to Sierra Leone every week, exposing the country’s fragile security and adding to the economic hardship. West African leaders, including Sierra Leone’s, decided to set up a peacekeeping force called ECOMOG to stem the tide of the Liberian carnage. Sierra Leone contributed troops to the force: the first batch that left included Strasser. Shortly after, Bio was despatched to Liberia as part of the second batch of Sierra Leone’s contribution to ECOMOG. The soldiers sent to Liberia were the best that the country had; as such, after their departure the borders of Sierra Leone were left largely unprotected. In March 1991, Foday Sankoh’s Revolutionary United Front (RUF) invaded Sierra Leone from Liberia, and overran the border regions in the Eastern and Southern Provinces. It was not until September that year that Bio and some of his colleagues were redeployed to Sierra Leone, in the Kailahun District. The Sierra Leonian army was so poorly armed. The soldiers had guns from the Second World War: often the guns couldn’t fire. “Our weapons were no match for those that the rebels had,” Bio remembers. “We felt that we were set up to be slaughtered. Our guns were not firing at crucial moments. This was what created the myth of Rambo: the invincible rebel whose body was impervious to bullets. Well, the bullets weren’t getting to him, you see. Many other young officers, it turned out, were doing the same thing. Strasser, who had also fought in the Kailahun area and had sustained a bullet wound in the leg (which partially disabled him), was now at Benguema as paymaster. But he was in touch with Bio and Hirsch; he visited them any time he could. “One evening, we were sitting at ‘Bodehose’ in Segbwema – myself, Strasser, Prince and some others. We vented our bitterness,” Bio recounted. “We were not getting food, our [weapons] weren’t firing, we were neglected. And here was this government which created the conditions for the war itself, seen as benefitting from the war. We were being killed for their crimes and profit. We knew Momoh and his APC weren’t interested in the multiparty business; they were trying to sit it out. We decided that they had to go. We wanted a clean slate.” That romantic language – a “clean slate”, suggesting optimism about the depth of possible change – is unusual with Bio, who does not even use the word “comrade”, preferring “colleagues” or “friends”. In the event, while Bio and Hirsch were preparing to launch an attack against the RUF at Lalehun, Hirsch was murdered. “My hunch tells me that he was killed by ULIMO [an anti-Taylor faction that was being supported by the Sierra Leone government at the time]. Strasser and Bio did all the planning. Bio said SAJ Musa, Tom Nyuma and Lt. Sandy were later brought in. “We had planned to move against Momoh on 30 April,” Bio said. “But overzealous Nyuma and SAJ Musa forced our hands [so we had] to act earlier, a day before. They commandeered a vehicle belonging to Major S.B. Kanu in Kenema on the 28th, and drove it all the way to Freetown. Bio and Strasser had already mobilised 40 hardened soldiers in Freetown, who were ready to spring into action. Strasser was in Freetown, while Bio was still in Segbwema planning to move to Freetown the night of the 27th (Sierra Leone’s independence anniversary day). Nyuma and Musa crashed into Freetown on the 29th, and Strasser quickly mobilised the 40 waiting men. The soldiers easily occupied State House, and the slothful Momoh fled to Guinea. The NPRC was launched. Bio was 28 at the time, and Strasser 25. And what about Major Yayah Kanu? I asked Bio. “He knew nothing about the coup plot,” Bio replied. “He was commanding officer for Nyuma and Sandy. After Nyuma and the others occupied State House, he approached them. Perhaps he was sent by the APC to talk his boys out of it. But later, after Momoh fled, I think he wanted to commandeer the coup by using Nyuma to take power for him. Surprisingly, giving the leading role he played in the coup, Bio initially took the fairly minor position of secretary of state for the south, and then, quickly, the post of secretary of information and broadcasting, though he was a key member of the Supreme Council of State, the NPRC governing body. Strasser became Head of State and chairman of the NPRC, and SAJ Musa the deputy. Nyuma was appointed secretary of state for the east; and Benjamin, the only civilian member of the coup, was made chief Secretary of State, or Prime Minister. On 29 December 1992, the NPRC, barely seven months in power, announced that it had foiled an attempted coup. Strasser announced that “a group of officers and civilians had attacked the presidential residence at Kabassa Lodge” in Freetown. The next day, he announced that the coup plotters, according to him numbering 26, had been executed after a trial by a military court. Much of what preceded this announcement became clearer only later. It emerged that Lt. SAJ Musa, Strasser’s choleric deputy, had coordinated the arrests and brutal murder of the alleged plotters who, in fact, numbered 29, and they included: a palm wine tapper; a pregnant woman of no known political affiliation; about half a dozen newly-recruited police trainees; several people who had been in detention at Pademba Road prison at the time of the alleged plot; and a fortune teller or “herbalist” who had been allegedly consulted by the alleged plotters. It was a sordid moment in the life of the regime, and it certainly helped change the trajectory of the NPRC from the course of brash reform and national and international embrace, to condemnation and a lapse into self-defensive neurosis. What was Bio’s responsibility for this? He says he stands by his testimony to the Truth and Reconciliation Commission (TRC); its report in 2004/05 had this to say: “SAJ Musa had known some of those implicated in the coup from their time together in the army; he regarded them unambiguously as traitors who had betrayed him, personally and politically. “According to Maada Bio, who had known in advance of SAJ Musa’s volatile temperament and the likelihood that he would attempt to carry out some kind of summary justice, some of the implicated men were taken to Musa’s own residence and subjected to torture by Musa himself: ‘When I went there at night, he had actually tortured them very seriously – their ears were cut off and they were practically dead ’. “SAJ realised that by daybreak they had been really badly tortured in his compound: ‘It was better to do away with them, than to keep them on his hands in this terrible state’ – he was then alleged to have organised the summary executions. “Maada Bio lamented their inability to put the coup plotters through proper judicial process, blaming it on SAJ Musa’s ambitions for power: ‘To a very large extent, SAJ was somebody who liked power and could do anything to retain it…. that was the darkest side of our whole period in power’,” Bio told the TRC. “SAJ Musa’s quest for power was an obsession for the man; and he had a wife who inculcated that into him; so it was a terrible combination. It somewhat betrays an ignorance of how the early NPRC, a ramshackle junta, operated. Strasser, weak, often dissipated, was hardly in control, and SAJ Musa was virtually running riot. But again, why did some members of the NPRC, including Strasser himself, defend and continue to defend the killings? Clearly there was no trial, though the NPRC’s spokesman at the time, Karefa Kargbo, told the BBC shortly after the killings that he and his colleagues had concrete evidence of the coup plot, including the most telling: “a written agreement” between the coup plotters and “an illiterate herbalist”. Talking about the 30 December killings was the most uncomfortable point of my conversation with Bio: he still clearly thinks that it was the most disastrous thing that happened under the NPRC, and Bio’s bitterness at SAJ Musa’s murderous behaviour that day was undisguised. The revulsion that the killings caused for the NPRC became very infectious. Things began to fall apart for the junta. In a move that was orchestrated by Bio, SAJ Musa was chased out of the country, and Bio, rapidly promoted to brigadier, became Strasser’s deputy and chief secretary of state. In that position, Bio became the most powerful man in the country. Strasser, now remote and unengaged, was, rather, something of a figurehead. He wasn’t even attending cabinet meetings, and he became too beholden to certain civilian members of the NPRC who had formed a political party, the National Unity Party (NUP), to contest elections scheduled for 1996. As a result, Strasser was dispatched out of the country, in a helicopter, to Guinea in 1995, and Bio took over as head of state. Bio, rapidly promoted to brigadier, became Strasser’s deputy and chief secretary of state. In that position, Bio became the most powerful man. In 1995, and Bio took over as head of state. There had been some speculations that Bio was not serious about either the peace talks or the democratic process. I followed both very closely at the time, attending the peace talks in Côte d’Ivoire as well as covering the democratic process daily. The RUF, it seemed, had been waiting for such a gesture. Sankoh quickly sent word through the International Committee of the Red Cross that he was willing to talk to Bio, who responded publicly that he too was ready to talk. He announced that both Ivorian president Henri Konan Bedié and Burkina Faso’s Blaise Compaoré were actively attempting “to get the NPRC and the RUF to the table”. A few days later, over an ICRC radio hook-up at the British High Commission (which I witnessed), Sankoh told Bio that he had to postpone the scheduled elections before any progress towards negotiations could be made. Bio’s response was that such a decision was ultimately up to Sierra Leoneans and suggested that the two meet in Côte d’Ivoire or Burkina Faso. 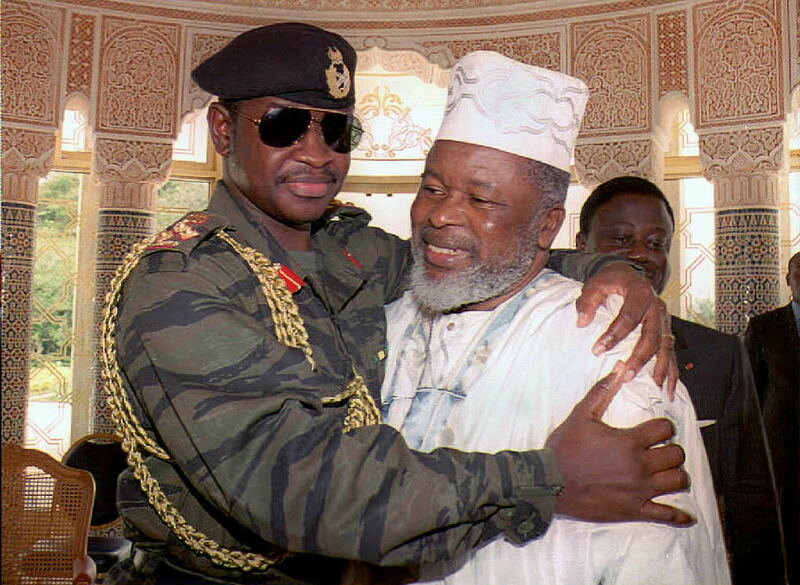 Sankoh rejected the two venues at first in favour of talks within Sierra Leone, but his resistance quickly evaporated and a meeting was set up in Abidjan for the end of February 1996. I arrived in Abidjan a week or so before the peace delegates did. With my friend the late Ambrose Ganda, I visited the place where some of the RUF representatives in the country were living, a gated house in one of the suburbs of Abidjan. Bio certainly kept to the timetable to hand over power. That power went to the SLPP and its new leader, Ahmad Tejan Kabbah. The peace talks, at least as far as Bio’s involvement went, did not at all appear rigged. Bio certainly kept to the timetable to hand over power. That power went to the SLPP and its new leader, Ahmad Tejan Kabbah. Some of Bio’s colleagues were not at all happy: they had set up a new party, the National Unity Party (NUP), and they had expected Bio to manipulate the outcome of the polls to give power to them. Bio left the country after handing over power, and took two degrees in the USA. Strasser, on the other hand, flunked his studies at Warwick University in the UK, and returned to Sierra Leone a diminished man. I asked Bio which candidate he takes most seriously as a rival for the SLPP flag-bearer position. He didn’t hesitate. “Three people really, and for various reasons,” he said. “The first is Dr Kadie Sesay. She has excited potentially the same people who would support me, and many of them are coming to me to suggest that she and I pool together. I’m very open to that. “The other is Andrew Kellie, for similar reasons. And then there is Usman Boie Kamara, for the simple reason that he has a lot of money, and this current phase is about winning [over] delegates. You see what I mean.” Knowing what odds he has had to overcome in his life, underestimating Bio may not be well advised. **** As they say – the rest is history. Bio was last night 4 April inaugurated as the new President of Sierra Leone when his opposition Sierra Leone People’s Party (SLPP) beat the outgoing ruling party All People’s Congress (APC) who fielded former Foreign Minister Samura Kamara. Bio was declared the winner of a controversial presidential run-off by 51.81 percent of ballots according to official results. Sporadic protests from APC supporters were reported following his inauguration.